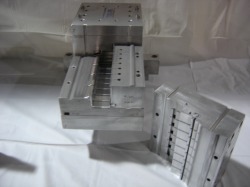 DieDesign/Tooling - Extrusion Solutions, LLC. Extrusion Solutions can help you design your Extrusion "Hot Die" and the proper sizing of your profile dependent on your customer needs and budget. 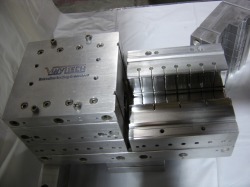 Depending on the output rate, material, type of downstream equipment, and most importantly the length of each production run, Extrusion Solutions will recommend the correct type of tooling and design. 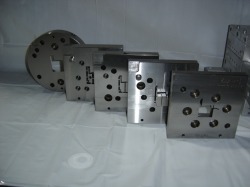 We also have"World-Class Toolmakers" ready to serve you! Extrusion Solutions can help you design the downstream sizing (Shape retention & dimensional control) for your needs. From water tank templates to fully "Engineered European-Window-Lineal Calibration" style sizing, we can help you design and build the correct tooling.